It would certainly have been an honor to be in the physical presence of Jesus back in the 1st century. 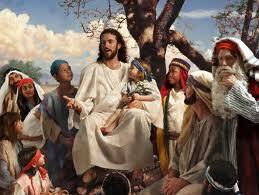 To see Him with our own eyes, touch Him with our own hands, and listen to His words with our own ears would be amazing. During Advent, we remind ourselves that one day we will actually see Him face-to-face, just like those disciples in the Gospel of Luke. We prepare for that day and the day when He comes again at the end of human time. So really, if you can fight the need for immediate gratification, we will, God-willing, have that privilege at some time. However, while we look toward the future, we still have Jesus in our midst right now. First, let us never look past the real presence of Jesus in the Holy Eucharist. Advent is a great time to increase our mindfulness of His presence in the Sacrament and work on our devotional life. Jesus’ words in Luke can just as easily be said to us, for those who look and see Jesus in the Holy Eucharist are indeed blessed. Others desire to see Him there, but for many different reasons they remain blind. Second, we are Jesus to a world that seeks to see Him. Especially after receiving Him at the Liturgy, we go forth with the hope that the world no longer sees us, but Jesus in our place. To bear the name of Christian means more than telling people who we follow, it means we have put on Christ and bring the real and living Christ to a world who so desperately needs to see and hear Him. During this Advent season, and during this upcoming Year of Mercy, how will you be Jesus for those around you? Are you ready to truly become Jesus to a world who seeks Him? You are blessed to even have the chance to do so. When others find Jesus in you, then they will be truly blessed as well. ← You’ve Got Beautiful Feet!